Stephen B. Farmer - Steve Farmer was born in Morgantown, West Virginia. He received a bachelor of science degree from West Virginia University in 1979 and a degree from the West Virginia University College of Law in 1984, where he was a member of the Law Review, Moot Court Board and Marilyn E. Lugar Trial Association. He was the recipient of the 1982 Baker Cup Moot Court Award. Mr. Farmer focuses his practice on trial work, including commercial, product liability and personal injury litigation. He is a member of the American Bar Association (Sections on Litigation and Criminal Justice), the West Virginia State Bar, the Kanawha County Bar Association, American Association for Justice, West Virginia Trial Lawyers Association and West Virginia Defense Trial Counsel. 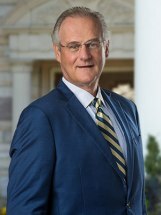 Mr. Farmer has served as a faculty member of the Trial Advocacy Institute, University of Virginia School of Law since 1988. Mr. Farmer has an AV "Preeminent" rating from Martindale-Hubbell and has been recognized as a Super Lawyer in West Virginia by Thomson Reuters for more than ten years. He is currently recognized as one of the Top Ten Super Lawyers in West Virginia by Thomson Reuters. Mr. Farmer is also a member of the Million Dollar and Multi-Million Dollar Advocates Forums.